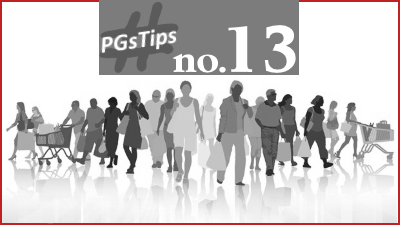 Hello and welcome to another edition in my series of #PGsTips. Work this out and you’ll generate MORE SALES with LESS advertising spend – it’s a double win! Accurately defining your ideal customers is well worth the time and effort. I now generate a lot more sales with a lower advertising spend then ever before and it’s all thanks to running the exact process I’ve shared below. However, before I take you through the entire process, step-by-step, let me run you through this quick story to help position the importance of understand this in your business. I’ve had this discussion several times, but it always surprises me how common a problem this is…and yet it’s so easy to fix. Last month, I was chatting to Mark, a local businessman, about his prospective clients and how well he knew them. Mark was spending quite a lot on advertising, and whilst generating a little return, he was frustrated that his advertising was sometimes being constrained by a lack of cash flow. He knew he needed to be advertising more but was concerned that some campaigns seemed to run at a loss and cost him money rather than generating profit. He responded well in terms of the specific industry sectors and some niche job titles that he was targeting. Mark also knew and understood the specific benefits that he could bring to their businesses and the improved results that he would leave behind. This is an essential starting point, particular with Business to Business relationships. However, far too many people stop their research at this point. These people forget that they are selling to real people first and only after that initial emotional connection has been made, will they have the opportunity to sell the benefits that they can bring to their prospects’ businesses. For example; you may have the perfect solution to a serious business problem. However, if your target audience is female, socialist, in their late twenties and very active on social media sites, it is unlikely that placing an advert in the classified section of the Daily Telegraph will successfully reach all of your target market! That might be a little extreme…but I trust you get my point. Whilst the above is obviously a waste of time and money, I see way to many business owners and entrepreneurs making similar errors. So, as I continued my friendly interrogation of Mark’s business plans, my follow-up questions about the age of his prospects, their gender, what cars they drive, what magazines they read, all suddenly started to make sense and he quickly realised that he didn’t REALLY know his target customers in any real detail. The benefits your customers experience after engaging with you, your products, and/or your services? If you’re not, complete this step before continuing. Once we’re VERY clear on these two previous points, we need to build up a profile of your target audience. In short we will create an AVATAR – a model of your ideal target customer. You will, more than likely, have more than one AVATAR and it’s a great idea to apply this process to clearly define your two, three or four top target audiences. Before we start the exercise, I’ve created some broad-brush, very generic examples here to illustrate the point. On every question these examples will hopefully help you appreciate that your marketing approach could be improved if you better understood the make-up of your AVATAR. You need to know whether to appeal to a predominately male or female or a mixed gender audience. The look and feel of your marketing materials, the colours used, the language used, the use of pictures, will all elicit a different response. For example, chocolate advertising was historically aimed at women. In the 1980s Rowntree’s launched the Yorkie Bar, a chunkier alternative to Cadbury’s Dairy Milk, and it was specifically aimed at men using advertising involving lorries, truck drivers, and, controversially; the tagline “It’s not for girls”! ACTION:- Define your target gender groups and the percentage split. 2] HOW OLD ARE THEY? A 35 to 40 year old bachelor may well purchase a Nespresso coffee machine as he wishes to aspire to the lifestyle, the sophistication and the apparent female attraction powers a Nespresso machine automatically offers, according to the the George Clooney adverts at least! Where as a 65 year old retired CEO is more likely to be swayed by the actual quality of the coffee itself, the ease of using the Nespresso machine and the cost of the replacement coffee pods. ACTION:- Define your target age groups. 3] WHAT IS THEIR ROUGH INCOME LEVEL? Whilst perhaps this picture is becoming recently blurred at the edges, Waitrose’s and Marks and Spencer’s traditional supermarket advertising has promoted the high quality of their products, whereas Lidl’s and Aldi’s marketing is usually far more direct about offering value for money and cheaper prices. Whilst there may be some in-fighting for the middle ground (the Sainsbury, ASDA, Morrison and Tesco shopper) the “quality” supermarkets are looking to capture and retain a different market from the “discounters” and understanding differing income levels is a key factor in their marketing message. ACTION:- Define your target customer income level ranges. 4] WHAT TYPICAL PROFESSIONS DO THEY HOLD? Professions will give you some guidance as to your audience’s values. Software salespeople are very different animals than teachers, nurses and occupational therapists, and marketing techniques that appeal to people in one profession will strike a very different note to those in a very different job! The car industry is very good at segmenting its brands and models to different audiences. In the bizarre world of car “status” advertising, Mercedes Benz, BMW and AUDI are brilliant at appealing to aspirational young “executives” and their families. ACTION:- Define your target customer professions and split them out into as many groups as required. 5] WHERE ARE THEY BASED? This question about location concerns BOTH where do they live AND where do they work. Use this as a way of getting inside their daily routine. Are they city based commuters or village living country people who work from home? ACTION:- Define your target customers location and daily lifestyle. 6] WHAT TRANSPORT DO THEY USE? Do they walk, cycle, take the bus, catch the train, drive a lorry, van, or car, hire taxis, catch Ubers, board planes or travel by boat. As above this helps to define their values and lifestyle – convenience verses ecology, time poor verses money saving, very busy and active verses fitness fanatic etc. ACTION:- Define your target customers transport choices and lifestyle aspects. 7] WHAT’S THEIR MARITAL STATUS? In other words, on what do they spend their disposal income? It is a cliché that single men buy sports cars whereas married men spend their money on bathroom renovation projects but married people (of both sexes) are more likely to spend money on household goods and decoration than single people. The newly married are also more likely to spend their money on joint entertainment activities; meals out, cinema and theatre, weekends away etc. than on more solitary activities such as model making or playing an instrument etc. However, people who have been married for many years are also likely to develop their own hobbies that are not dependent on their partner. ACTION:- Define your target customers marital status and lifestyle choices. 8] DO THEY HAVE CHILDREN? This is an essential question as children are a game changer. Children are expensive and the Centre for Economics and Business Research has calculated the average cost of raising a child to the age of 21 in the UK in 2016 is now a staggering £231,843. In general, couples with children have less disposable income than those without children. There is also a mind-set change here. Couples with children will have different priorities and their purchasing decisions will be more aimed at the future of their children than in satisfying their own material desires. A mother may be more motivated to buy her child a bicycle so they can cycle together than to upgrade her iPhone to the latest model. ACTION:- Define your target customers family status and lifestyle choices. And therefore where best to spend your hard-earned marketing pounds in attracting their attention? This also helps in drawing the picture of your AVATAR’s interests. For example, a man who watches Top Gear on Dave, reads FHM magazine and The Sun, listens to Radio One and frequents Hardrockhaven.net, will require a different marketing approach from a woman who watches Strictly Come Dancing, reads Cosmo, listens to Radio 2 and spends most online time on very.com and countryliving.co.uk. ACTION:- For each of the groups you define start building a list of media that would be of interest to them. 10] WHAT ARE THEIR PREFERRED SOCIAL MEDIA PLATFORMS? Facebook, Twitter, Instagram, Snapchat, LinkedIn, Google+, Vimeo, YouTube etc are each growing in popularity so it’s important to understand where your prospects “hang out” online so you can properly target them. Generational behaviours are also changing dramatically – did you know that the over 30’s search for written advice via Google yet the under 20’s are more likely to use YouTube to watch a helpful “How To” video? ACTION:- Survey your audience and ask them which platforms they use and how often. Search for groups, forums and communities your target audience would join, which platforms have the most members and the highest levels of engagement. 11] WHAT’S MOST IMPORTANT TO THEM AND WHAT VALUES DO THEY HAVE? This is about character types – are they “alpha” people who just want to know the price and the anticipated results – or are they detail people who want to evaluate your product or services and gain confidence first before buying. Do they purchase a product, try it and throw it away if it fails to meet expectations, or will they take it apart, fix it, and adapt it for their own purposes? Do they buy on price alone or are they more concerned with quality and long-term reliability? ACTION:- List out your thoughts on why people buy from you, ask customers why they chose you and build a list of the answers for each group of AVATARS. 12] HOW TECH SAVVY ARE THEY? It’s no good providing an app if your prospect doesn’t have a smartphone, a tablet or a SmartTV. Your marketing needs to match and stand out on the platform that your audience is comfortable with. It is no coincidence that many companies have returned to sending “snail mail” postcards to their ‘older’ prospects driving traffic to websites with discount coupons and special offers. Whilst more costly, if you’re mailing to highly targeted prospects with a proven buyer profile you can generate healthy profits. It’s quite common to see the ‘younger’ audience being targeted with the same promotion via Facebook and Instagram adverts. ACTION:- Look at your audience spread and decide if split campaigns across multiple platforms and delivery medium would be beneficial. 13] WHAT GENERAL INTERESTS DO THEY HOLD? People who play chess may hang out with people who play card games and may like solving puzzles, they may well be members of groups and forums on these topics too. People who like Interior Design may attend home improvement shows, shop in certain stores and like certain pages of Facebook. These are, of course, wild generalisations but I trust you get the general idea. What we are looking for here are crossover markets – a Sudoku magazine may also sell to chess players, bridge fans, poker experts, and mathematicians. The better we know our clients, the easier it is to locate and engage with others who may well share an interest in our products or services. ACTION:- Define the interests your audience have, segment them by lists and look for crossover opportunities and new forums, groups and blogs you may not have considered before. 14] HOW DO THEY WORK? In many sectors, the world of work has and continues to change dramatically. Whilst the factory and the office still exists, the former continues to automate and latter is becoming more virtual and more collaborative than ever. ACTION:- Define how your avatar groups work. Consider what other companies and services they use to help them work in that way. 15] WHERE DO THEY WORK? So is your marketing going to the right place? Should your marketing be more mobile friendly? Is the timing of your communication appropriate for where your target audience is currently sitting? TOP TIP – If your business relates to your AVATAR as a hobby or spare time interest break times and lunchtime communications can be very effective. If your product or service is a family purchase consider communicating with them in the evenings when there’s chance for them to talk it over with their partner. ACTION:- Build an overview of your AVATARS typical working day or week. Do you need them to be at work, or would your communication be better received if they were at home and able to talk it over with the partner? 16] WHY DO THEY NEED YOUR PRODUCT OR SERVICE? Where you are targeting a job title in a sector, what is the benefit to THE INDIVIDUAL in being associated with your product and services that may ultimately benefit their business? For example; if you’re selling a product or service to another business the owner may increase their profits and perhaps save time too. Perhaps their are some additional benefits to their employees too. It can be very effective to identify if there’s a potential double sale – benefits to the business and it’s employees. ACTION:- Define how your USP’s (Unique Selling Points) relate to your AVATARS challenges and the pains/frustrations they experience. 17] HOW DO THEY RELAX, WHAT HOBBIES DO THEY HAVE? A 5k run, watching TV, a fine glass of Burgundy, spending time with the family, going for a drive, playing online computer games, playing golf, visiting museums, learning a language, card games, line dancing… all of these activities should give your ideas about how to market to them in an original and unique way – making someone feel special is part of the game! ACTION:- Define how they spend their time off, their social and family time. 18] WHERE DO THEY SHOP? Do they frequent John Lewis or TK MAXX? Would they browse the latest bestseller at WH Smith or in a unique corner bookshop? Do they buy their clothes from Next or bespoke designer boutiques? If you know where they shop, you can start to understand how they buy. If you know how they buy and who from you can start to model marketing messages, talk their language and increase your conversion rates – what is it about these articles that won the sale? Do they value quality over price or visa versa. Can you modify your own presentation to match their values and therefore make the sale easier for you? ACTION:- Build a list of typical shops and values for each of your Avatar groups. The more you know about your target audience, the better your marketing will become and the more sales opportunities will appear. Remember what I said at the start. I overlooked this for far too long thinking (incorrectly) that I knew enough and my marketing was close enough. I WAS WRONG! Very wrong…when I actually took a few hours out to work this it instantly made a HUGE INCREASE in my sales conversion rate. Personally and when I work with clients one-to-one, we build this in so much detail that we even give each group AVATAR a name. So… for me, when I talk about “Alan”, “Brenda”, “Charlie” or “Diane” I immediately know their characteristics, I’m able to think in a very similar way to them, I’m able to write adverts that will appeal and place adverts in the right place at the right time. I know you might be thinking this all sounds like a lot of effort. HOWEVER, I can guarantee you that when you get REALLY clear on your target AVATARS you’ll start generating greater engagement and start placing clever, more thought out adverts that generate more sales with less spend. Until the next time, have a great day.